Photo by Ashley’s Photos, from the Torontoist Flickr pool. 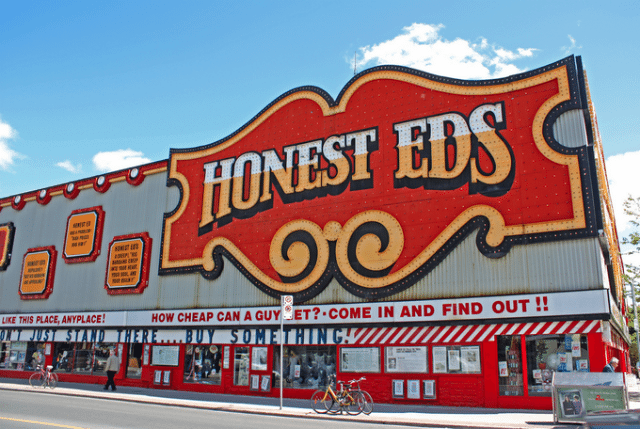 In October 2013, it was announced that cultural landmark (or hard-to-believe eyesore, depending on whom you ask) Honest Ed’s, along with a number of standalone businesses nearby, had been sold to Vancouver-based Westbank Properties—and now Torontonians are getting insight into the kind of vision the developer might have for the 1.8-hectare parcel near Bloor and Bathurst streets. Westbank has not yet firmed up its plans for the site, but the company’s president, Ian Gillespie, indicated that they might involve rental options as well as the inevitable condos—and that there’s been talk of turning part of Markham Street into a pedestrian-only area, and incorporating restaurants, retail space, and a grocery store or public market into the redevelopment. Gillespie has also been talking to the University of Toronto about whether it might be interested in establishing a presence on the site. Councillor Mike Layton (Ward 19, Trinity-Spadina) noted that the company’s community consultations have highlighted local residents’ priorities, which include accommodating smaller retailers, providing open spaces, and retaining some aspects of the original Mirvish Village.